If foam systems are part of your fire protection plan, the latest edition of NFPA 11 is a key resource. Updated to reflect today's hazards as well as the systems and products in use, the 2016 Spanish edition of NFPA 11: Standard for Low-, Medium, and High-Expansion Foam is the industry standard that addresses all aspects of the design, installation, operation, testing, and maintenance of low-, medium-, and high-expansion foam systems for fire protection. Criteria apply to fixed, semi-fixed, or portable systems for both interior and exterior hazards. Changes impact fire protection designers and engineers as well as installers, property managers, and system maintainers. 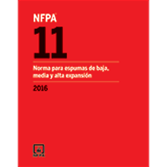 The 2016 Spanish edition of NFPA 11 expands and clarifies the types of pipe and fittings that can be used in foam systems. It also incorporates alternative test methods for foam proportioners and seal area-only protection for certain composite floating roofs.